Brad Jones Racing will celebrate a significant milestone at the WD-40 Phillip Island 500, its 250th championship event as a Supercars operation. Phillip Island is, coincidentally, where it all began back in 2000, when the team that tasted considerable success in Super Touring with Audis lined up with Brad Jones in a single Falcon. Nearly two decades later, Brad and Kim Jones’ operation has grown to field three Commodores from its Albury base, for Nick Percat, Tim Slade and Tim Blanchard. Brad Jones goes through the highs and lows for a team that has won races, taken Bathurst podiums and also been home to the likes of John Bowe, Jason Bright, Jason Richards and Fabian Coulthard. 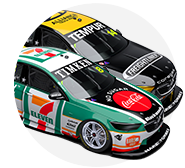 Jones and BJR enter Supercars with an ex-Tony Longhurst Racing AU Falcon, joining the series at the same time as chief Super Touring rival Paul Morris. 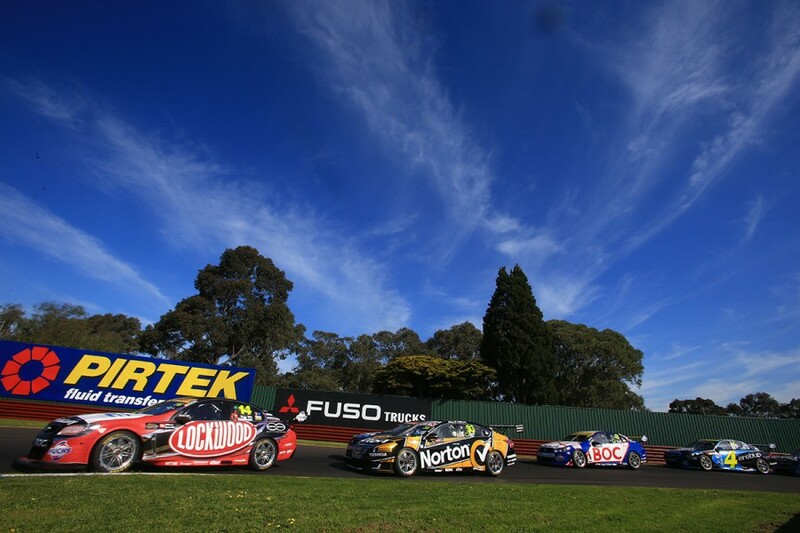 In a tough debut, Jones - a regular Supercars co-driver for the preceding decade with Bathurst podiums to his name - qualified 23rd and finished the two races 17th. “The first race was a bit of a shock and an eye-opener for us,” Jones recalls to Supercars.com. “We’d come from Super Touring where we were one of the dominant teams, qualified out of the top 20, and I can remember seeing my crew - which was the Super Touring guys - jump over the fence with the little battery pack and head towards the front of the grid! “Then they bumped into one another as they stopped and remembered that I was in the opposite direction. “I wouldn’t say it was a great experience, the first race, but what it did do was give us a pretty good grounding of what we needed to do as a team. “It’s not like we hadn’t had anything to do with Supercar racing; I’d raced in the enduros and we’d been to plenty of them, so we knew what it was like. 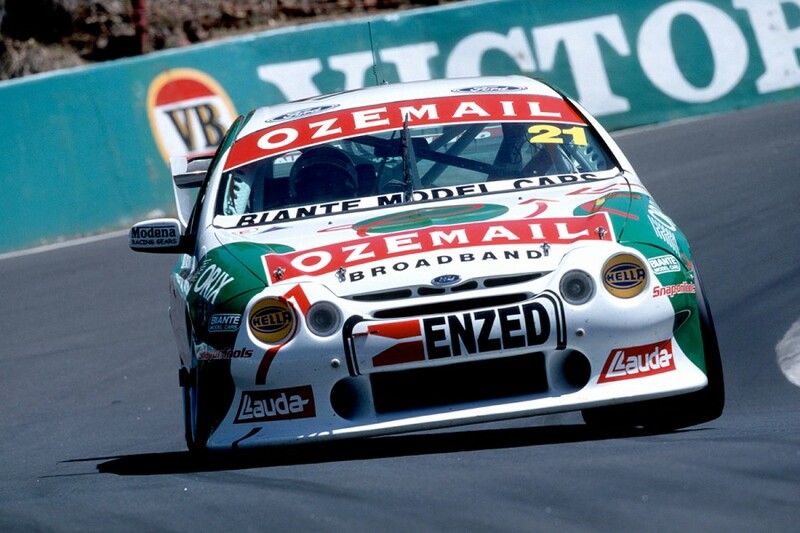 The team ran Jones in a single Ozemail AU for two seasons, with a second-place finish at Bathurst with John Cleland the clear highlight. “We changed the car a fair bit and I felt like we were making progress with it,” Jones says. “For every two steps forward, we’d have a little stumble, but we were making progress. “At Bathurst, we struggled in qualifying and we were starting 22nd, but on Saturday afternoon in the free practice, I really felt that we’d made some positive changes to the car. “It was a damp warm-up and every lap I went past the start-finish line, I’d look at the totem pole going from Turn 1 up to Turn 2 and I could see that we were P1. “It was wet and we stopped and put slicks on and straight away we were on fire. I think we finished that warm-up two or three seconds quicker than everyone else. I felt in the race we were going to be a good chance. “A couple of things happened in the race, Cleland’s radio stopped working and we dropped from sixth or eighth back to the last car on the lead lap, but we were in there in the end. 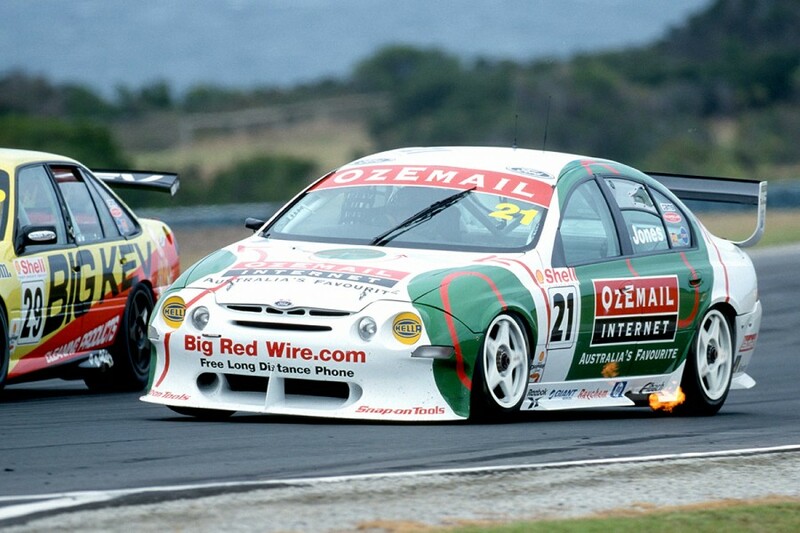 John Bowe arrived as BJR expanded to two cars for 2002, with the maligned AU Falcon replaced by Ford’s new BA the following season. Bowe finished 11th in the points in 2003 with Jones 20th, the pair 10th and 26th for the round at Surfers Paradise, Jones having failed to finish the opening race. “It was great to have JB join the team,” Jones says. “He was at a point in his career where he was looking for a home. He fitted in really well with our group, we had some people like Phil Curtis that had experience with JB and really we hit our straps. “Through those years, we were the second-best Ford team in the category [behind Stone Brothers Racing], we often finished in the top 10 and were very strong. “Together, we were certainly one of the top-five combinations at the enduros; at that point in time you could join your main drivers together, which I looked forward to every year. 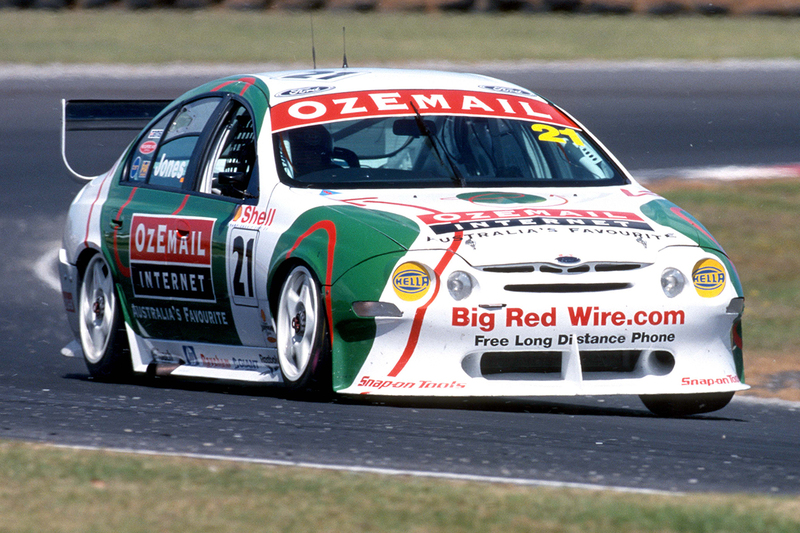 Even before the arrival of the new Falcon, BJR was building its own Fords, and Jones views Bathurst in 2002 as a Great Race that got away. “That was probably year we had the fastest car,” he says. “I broke the lap record in the race. “I had some contact with Russell Ingall in practice and it had damaged a rose joint, which we’d missed and then it broke in JB’s stint and we dropped three laps. “To give you an idea of how the car was, we unlapped ourself on pace. “That was a pretty disappointing year. We’d started to build the business and get to a point where we were manufacturing our own cars. “We were buying chassis from [Peter] Beehag, but we were putting all of the pieces together ourselves and really, that’s the way BJR operates now. Over the following years, BJR’s Falcons fell off the pace, even with a switch to use Stone Brothers Racing engines. 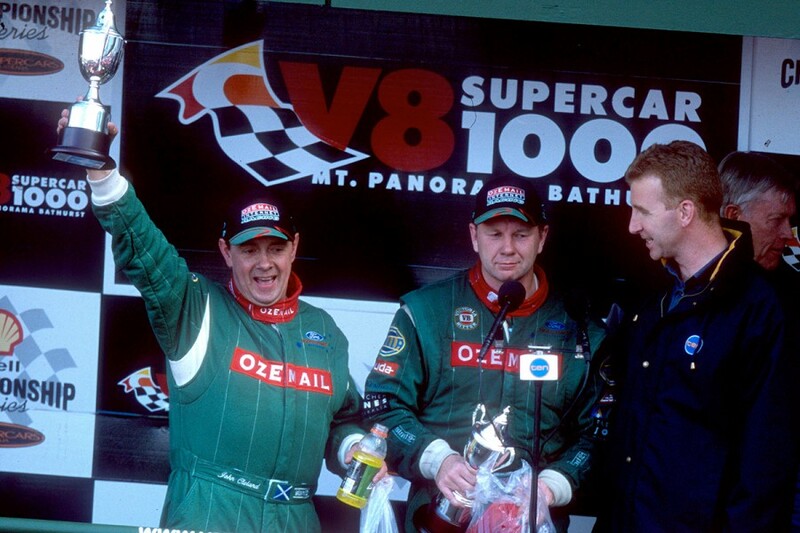 Jones and Bowe took another Bathurst podium with third in 2004 - both drivers’ last trip to the Great Race rostrum - but gradually drifted down the standings. Bowe left at the end of 2006 to join Paul Cruickshank Racing for his farewell tour, while Jones stayed on to partner Andrew Jones, the son of Kim. Jones, though, actually beat Bowe to full-time retirement. He stepped back after the third event at Pukekohe, with a back injury then curtailing a plan to return for the enduros. 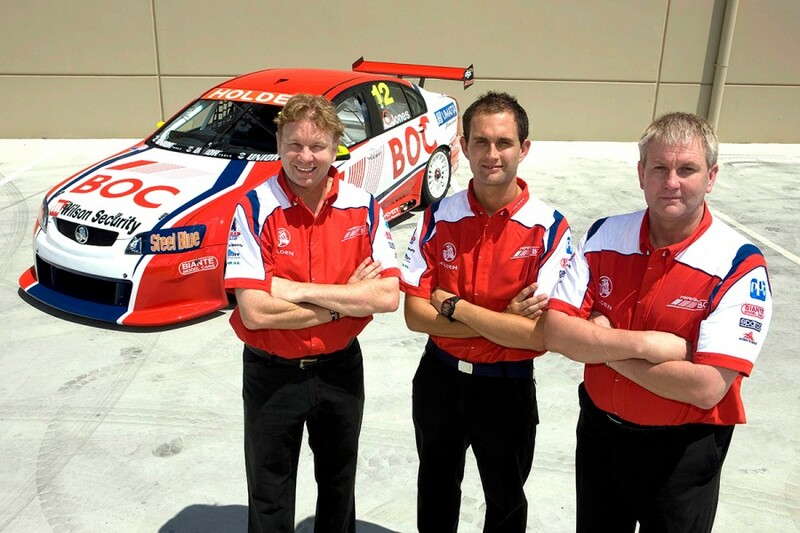 The Team BOC Falcons of Andrew Jones/Simon Wills and Damien White/Christian Murchison started 24th and 31st in the Sandown 500 and failed to finish. A switch to ex-Walkinshaw Holdens was later announced for 2008. “That was a really difficult time,” Jones recalls. “We’d gone from being a very competitive team to what I would have described at the time as probably the second-worst team in pitlane. “Me retiring was one of the things that Kim and I felt the business needed to move forwards. “With my retirement, I looked at trying to help on the racing side of the organisation and that freed Kim up more to focus on the marketing side of the business. “And then we spent a lot of time formulating a plan to get back to the front of the field, which is obviously a very difficult thing to do when everyone’s trying their best, every weekend. “As part of that, we went to both Ford and Holden and talked to them about what sort of support, resources we would get. “It wasn’t just about money; Ford weren’t helpful at all, really, and [then motorsport boss] Simon McNamara at Holden was extremely helpful. “He facilitated the ability to buy a couple of Walkinshaw cars and really that was part of the great plan. “We wanted to make sure we had a good mousetrap and do to that, rather than build our own cars, we decided the right way forward at the time was to get something that was quite successful. 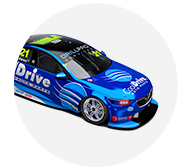 The team’s all-Jones line-up between Andrew’s arrival from Tasman Motorsport and Brad’s full-time retirement was ultimately short-lived. Andrew was a full-timer for two seasons, pictured above in 2008, before he teamed up with his uncle for Brad’s final Bathurst start in '09. The pair ran as high as third but struck issues and ultimately had to settle for 23rd, 16 laps down. BJR, though, added another Bathurst podium to its collection, with Richards and Cameron McConville finishing second. “We’re obviously a very close family, so it was terrific to be able to go racing and still have one of us inside the car,” Jones said. 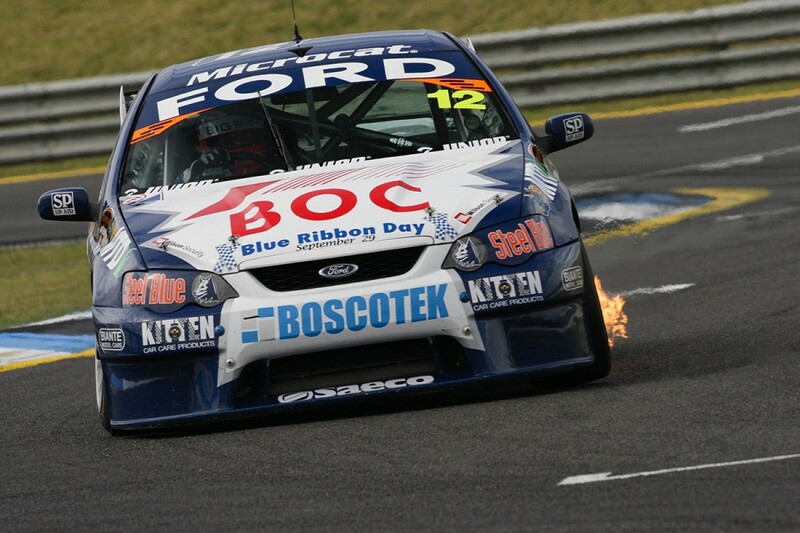 BJR’s switch to Commodores brought instant gratification, with new recruit McConville finishing third in the second leg of the 2008 season-opening Adelaide 500. The team continued to make progress, and added a third car when Bright and his Racing Entitlements Contract joined the team in 2010. 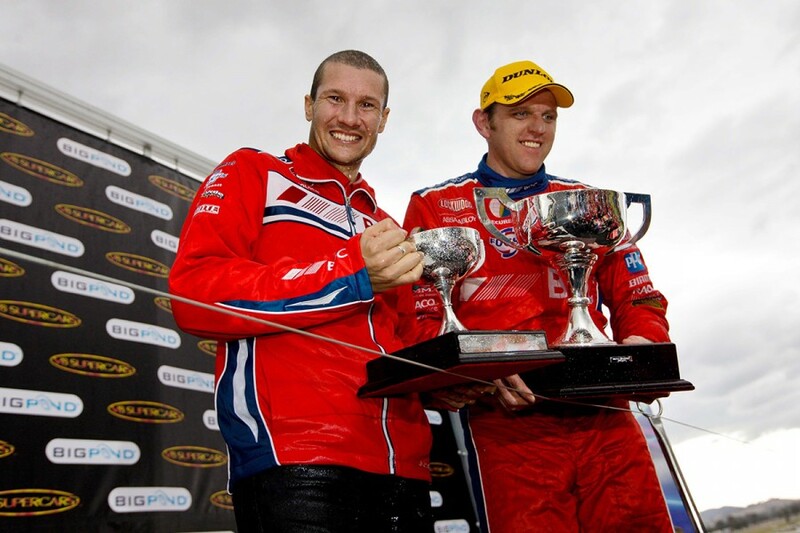 Supercars' annual trip to New Zealand in 2011 came one event before Bright broke through for BJR’s maiden Supercars victory at Barbagallo Raceway. At the Hamilton street circuit, Jason Bargwanna led the way with 13th on Saturday, before Bright took 11th on Sunday. “That was extremely rewarding,” Jones says of the team’s gains with the Commodores. “We had an IP deal with Walkinshaws where we manufactured a lot of the components ourselves that they designed, and at that point in time our target as a group was to beat Walkinshaw first and foremost. “They were our number one target and we used to do that extremely regularly, which was rewarding when you consider the difference in the size of the budget and the number of people they have. “We went through a bit of growing pain when we added a third car, but we needed to do that for Brighty to join the team, and that’s turned out to be quite a good opportunity for us to grow a little within the category. “But we really hit our straps through that time. Brighty was doing a great job. It wasn’t all smiles, though, with Richards stepping back in late-2010 when he was diagnosed with adrenocortical carcinoma. Bargwanna took over his Commodore for 2011, other than when Richards made a memorable cameo for the non-points Australian Grand Prix weekend that included a race podium finish. 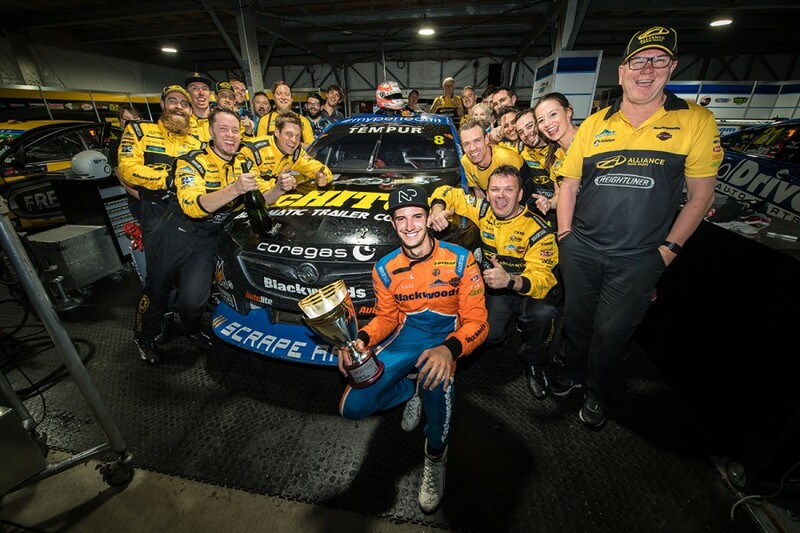 Bright won again at Winton, where Richards was on hand to help celebrate, before the Kiwi lost his battle in December 2011, aged 35. “It was a very difficult time through there with JR’s illness,” Jones reflects. “We have a very close-knit group and it would be fair to say that a lot of us were affected by his condition. “JR will always be part of our team. Winton was a fantastic sight, for JR to be able to get up on the podium and to be able to win a race. “He was fantastic, and we were having some issues - engineering-driver issues - and he was working with me to try to sort that stuff out at the time. BJR’s strategy shifted again in 2013, when it started building its own chassis to coincide with the introduction of Supercars’ Car of the Future Platform. Between Bright and Coulthard, the team won five races in 2013 and two in ’14, finishing third and then fourth in the teams’ championship. 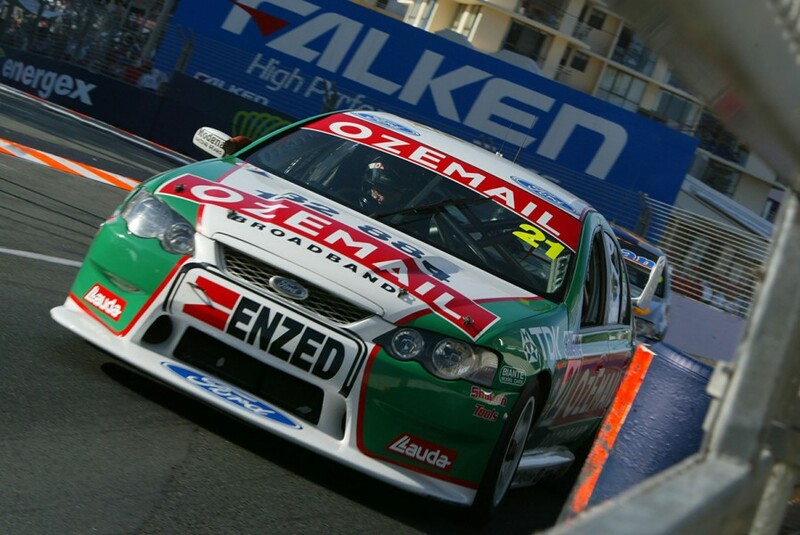 In the 2014 Sandown 500, Coulthard and Luke Youlden led the way for the team, starting 10th and finishing 11th. “I felt that the Car of the Future era was good for us at the start, our guys worked hard to make sure that when we came out of the blocks we were competitive,” Jones said. “When we went to Eastern Creek [for a pre-season test] at the start of the year, the cars were not finished, really. “From my memory they didn’t have wipers and things on them, but we worked pretty hard to make sure we had all of the wheels in the right place and we certainly hit the ground running. “We carried a lot of that pace through the year and it was a pretty rewarding year, we were very competitive, getting on the podium regularly and winning races. “They were great years, that was the first time we’d had a real swing at building our own chassis and we were making everything for the car. 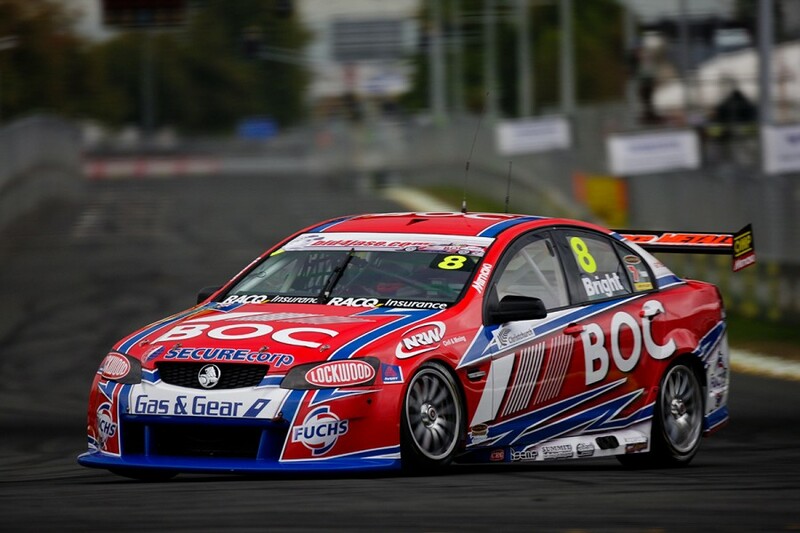 BJR has again adapted well with a change in Supercars this year, as Holden teams moved to the new ZB Commodore. Percat is eighth in the points after three events, having recorded a pair of podiums at Albert Park, with Slade 10th and Blanchard 23rd. “It feels pretty good,” Jones said of hitting event 250. “This year, we’ve again made some major changes and we’ve got a new engine supplier, we’re moving stuff around within the team and we’ve had a pretty good start to the year, with a couple of podiums already. “I feel like this is the best start we’ve had in probably two or three years.